Hana Hou they say on Kauai (again!) and the Makai Unlimited three to five day golf pass is a great way to experience our Top 100 Princeville Makai Golf Course again and again. The pass is a great way to save on your greens fees and play as much golf as you want if you commit to 3 days of play with us. The Princeville Makai 3 Day Flex Pass is just $160 plus tax per Day. (3 Day Flex Pass priced per person). For the guests who plan on staying with us for and extended period of time we are very excited to announce the addition of our Princeville Makai 6 Day Premium Flex Pass. This pass offers great savings to our guests who will play a total of 6 rounds or more on the Makai Course. This package is available for only $139 plus tax per day on our Top 100 golf course. 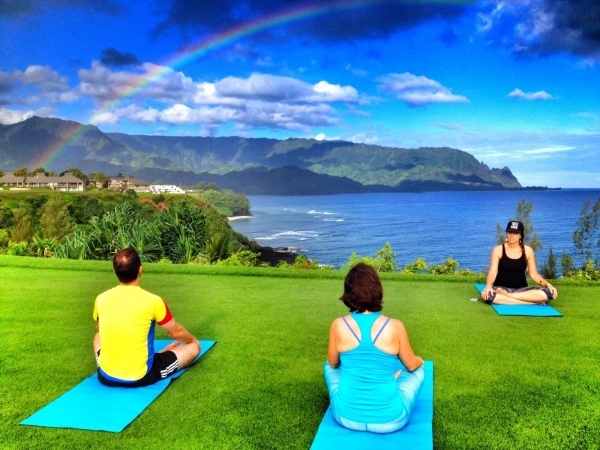 Princeville Makai 6 Day Premium Flex Pass priced per person. Our well respected Yoga instructor, Tulasi Adeva, is available for all to practice in paradise from 7:30am – 8:45am for yoga for all levels of Yoga. The studio where the group will practice their outdoor Yoga Experience is located on the back of our Signature 7th hole’s tee box. Each participant is asked to check in with Tulasi instructor by 7:25am at the Makai’s Golf Shop. As the group arrives to the site via golf cart they will see the Pacific Ocean and the North Shore’s world famous vistas in all of their glory! 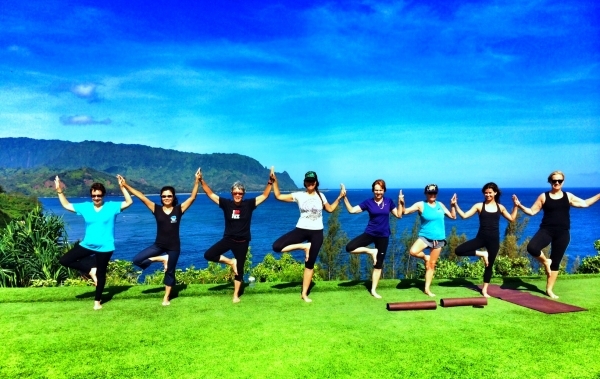 Once you are practicing your Yoga routine for the day you will hear and see Waves Crash Below, Clouds Catching The Morning Light and Hawaiian Sea Birds Fly High on our Signature 7th Hole Tee Box! We are proud to announce that starting January 1st, 2019 we willl be launching the Kama'aina Makai Card. The Member card gives all of our Kama'aina guests a chance to save on their "Makai Golf Course” greens fees. The application fee for this program is $425. The Membership is valid for the rest of the 2019 golf calendar year. * Individuals MUST present a valid Hawaii State Drivers License or a valid Hawaii State ID card with their name and a Hawaiian address to be eligible for the membership. The membership is an individual program. Each member card gets that member and only that member the discounted golf experience. Thank you all for supporting the Top 100 Princeville Makai Golf Club and Troon Golf. We look forward to seeing you soon! Mahalo!